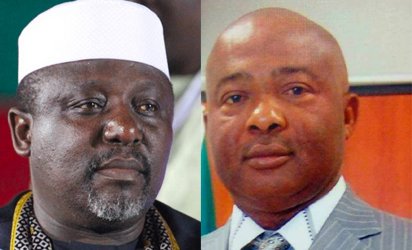 The governorship candidate of Imo state All Progressives Congress, APC, Senator Hope Uzodimma yesterday said that governor Rochas Okorocha, has concluded plans to destroy the APC in the state. Uzodimma’s Director of Media and Special Duties, Declan Emelumba, in a statement to Vanguard in Owerri, reacted to a report that Uzodimma was arrested for an alleged breach of contract. He added that the story of arrest was planted by Okorocha, as one of his attempts to destroy Uzodimma, having lost the APC, governorship ticket to Senator Uzodimma. This is as the publicity Secretary of the Imo state chapter of the All Progressives Congress, APC, Onwusanya FCC Jones, said that by their investigation Uzodimma did not execute the contract for which he was allegedly arrested. He pointed out that, “The story was planted by Governor Rochas Okorocha and his co-horts out of their dare-devil desperation to damage the image of the distinguished Senator before the Imo electorate who are poised to vote for him in 2019. “The arrest news is fake, baseless, unfounded and absolutely false, without any iota of truth, adding that, “Okorocha has refused to come to grips with the reality that his son-in-law will not succeed him as governor and is going all out to damage APC and its governorship candidate in next year’s election just to see if he can substantiate his false claim that there can be no APC in Imo state without him. The statement explained that, “Their latest plot is this Calabar dredging contract. However they should know that the company handling the Calabar dredging contract is Calabar Channels Management Company in which Nigerian Ports Authority (NPA) has 60% equity shares. Reacting Onwusanya said: “The Imo State chapter of the All Progressives Congress is aware of reports that Senator Hope Uzodimma, one of the governorship aspirants on our Party’s platform has been apprehended by Law Enforcement Agencies at the Lagos Airport. “Our investigations show that the Senator representing Imo West Senatorial District was arrested over his failure to execute a 12 Million Dollars contract awarded to him by the Federal Government of Nigeria. “This allegation, if proven true, is weighty enough and embarrassing for an individual purporting to be a chieftain of our Party. Our Party does not provide any form of shield to any individual who has questions to answer, especially, on issues of corruption and economic sabotage. “We urge the Senator to cooperate with Law Enforcement agents on their investigation, and also take appropriate steps to clean his image of the various scandals, especially, as they concern his alleged involvement in bribery, issuance of Dud cheques, diversion of funds and sundry embarrassing allegations. As a Party, we are ashamed that an individual with such controversies is associated with us.